This article is about the square in Paris, France. For other uses, see Place Vendome. Place Vendôme (French pronunciation: ​[plas vɑ̃dom]) is a square in the 1st arrondissement of Paris, France, located to the north of the Tuileries Gardens and east of the Église de la Madeleine. It is the starting point of the rue de la Paix. Its regular architecture by Jules Hardouin-Mansart and pedimented screens canted across the corners give the rectangular place Vendôme the aspect of an octagon. The original Vendôme Column at the centre of the square was erected by Napoleon I to commemorate the Battle of Austerlitz; it was torn down on 16 May 1871, by decree of the Paris Commune, but subsequently re-erected and remains a prominent feature on the square today. Place Vendôme was laid out in 1702 as a monument to the glory of the armies of Louis XIV, the Grand Monarque and called place des Conquêtes, to be renamed place Louis le Grand, when the conquests proved temporary; an over life-size equestrian statue of the king was set up in its centre, donated by the city authorities; this was by François Girardon (1699) and is supposed to have been the first large modern equestrian statue to be cast in a single piece. It was destroyed in the French Revolution; however, there is a small version in the Louvre. This led to the popular joke that while Henri IV dwelled among the people by the pont Neuf, and Louis XIII among the aristocrats of the place des Vosges, Louis XIV preferred the company of the tax farmers in the place Vendôme; each reflecting the group they had favoured in life. The site of the square was formerly the hôtel of César de Bourbon, Duke of Vendôme, the illegitimate son of Henry IV and his mistress Gabrielle d'Estrées. Hardouin-Mansart bought the building and its gardens, with the idea of converting it into building lots as a profitable speculation. The plan did not materialize, and Louis XIV's Minister of Finance, Louvois, purchased the piece of ground, with the object of building a square, modelled on the successful place des Vosges of the previous century. Louvois came into financial difficulties and nothing came of his project, either. After his death, the king purchased the plot and commissioned Hardouin-Mansart to design a housefront that the buyers of plots round the square would agree to adhere to. When the state finances ran low, the financier John Law took on the project, built himself a residence behind one of the façades, and the square was complete by 1720, just as his paper-money Mississippi bubble burst. Law suffered a major blow when he was forced to pay back taxes amounting to some tens of millions of dollars. With no way to pay such an amount, he was forced to sell the property he owned on the square. The buyers were members of the exiled Condé branch of the House of Bourbon who later returned to the country to reclaim their land in the town of Vendôme itself. Between 1720 and 1797, they acquired much of the square, including a freehold to parts of the site on which the Hôtel Ritz Paris now stands and in which they still maintain apartments. Their intention to restore a family palace on the site is dependent on the possible intentions of the adjacent Justice Ministry to expand its premises. The Foire Saint-Ovide settled in 1764 on the place until 1771. The original column was started in 1806 at Napoleon's direction and completed in 1810. It was modelled after Trajan's Column, to celebrate the victory of Austerlitz; its veneer of 425 spiralling bas-relief bronze plates was made out of cannon taken from the combined armies of Europe, according to his propaganda (the usual figure given is hugely exaggerated: 180 cannon were actually captured at Austerlitz.) These plates were designed by the sculptor Pierre-Nolasque Bergeret and executed by a team of sculptors including Jean-Joseph Foucou, Louis-Simon Boizot, François Joseph Bosio, Lorenzo Bartolini, Claude Ramey, François Rude, Corbet, Clodion, Julie Charpentier, and Henri-Joseph Ruxthiel. A statue of Napoleon, bare-headed, crowned with laurels and holding a sword in his right hand and a globe surmounted with a statue of Victory (as in Napoleon as Mars the Peacemaker) in his left hand, was placed atop the column. In 1816, taking advantage of the Allied occupying force, a mob of men and horses had attached a cable to the neck of the statue of Napoleon atop the column, but it had refused to budge – one woman quipped: "If the Emperor is as solid on his throne as this statue is on its column, he's nowhere near descending the throne". After the Bourbon Restoration the statue, though not the column, was pulled down and melted down to provide the bronze for the recast equestrian statue of Henry IV on the Pont Neuf (as was bronze from sculptures on the Column of the Grande Armée at Boulogne-sur-Mer), though the statuette of Victory is still to be seen in the salon Napoléon of the Hôtel des Monnaies (which also contains a model of the column and a likeness of Napoleon's face copied from his death mask). A replacement statue of Napoléon in modern dress (a tricorn hat, boots and a redingote), however, was erected by Louis-Philippe, and a better, more augustly classicizing one by Louis-Napoléon (later Napoléon III). 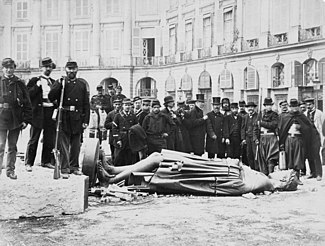 During the events in the run-up to the founding of the Commune, the 22 of March 1871 saw disturbances outside the National Guard when demonstrators holding banners declaring them to be "Friends of Peace" were blocked from entering the Place Vendome by guardsmen who, after being fired on, opened fire on the crowd. At least 12 people were killed and many wounded. In as much as the Vendôme column is a monument devoid of all artistic value, tending to perpetuate by its expression the ideas of war and conquest of the past imperial dynasty, which are reproved by a republican nation's sentiment, citizen Courbet expresses the wish that the National Defense government will authorise him to disassemble this column. After the suppression of the Paris Commune by Adolphe Thiers, the decision was made to rebuild the column with the statue of Napoléon restored at its apex. For his role in the Commune, Courbet was condemned to pay the costs of rebuilding the monument, estimated at 323,000 francs, in yearly installments of 10,000 francs. Unable to pay, Courbet went into self-imposed exile in Switzerland, the French government seized and sold the artist's paintings for a minor amount, and Courbet died in exile in December 1877. In 1874, the column was re-erected at the center of Place Vendôme with a copy of the original statue on top. An inner staircase leading to the top is no longer open to the public. At the centre of the square's long sides, Hardouin-Mansart's range of Corinthian pilasters breaks forward under a pediment, to create palace-like fronts. The arcading of the formally rusticated ground floors does not provide an arcaded passageway as at place des Vosges. The architectural linking of the windows from one floor to the next, and the increasing arch of their windowheads, provide an upward spring to the horizontals formed by ranks of windows. Originally the square was accessible by a single street and preserved an aristocratic quiet, except when the annual fair was held there. Then Napoléon opened the rue de la Paix, and the 19th century filled the place Vendôme with traffic. It was only after the opening in 1875 of the Palais Garnier on the other side of the rue de la Paix that the centre of the Parisian fashionable life started gravitating around the rue de la Paix and the place Vendôme. The place Vendôme has been renowned for its fashionable and deluxe hotels such as the Ritz. Many famous dress designers have had their salons in the square. The only two remaining are the shirtmaker Charvet, at number 28, whose store has been on the place Vendôme since 1877, and the couturier Chéruit, at number 21, reestablished in 2008. Since 1718, the Ministry of Justice, also known as the "Chancellerie", is located at the Hotel de Bourvallais located at numbers 11 and 13. Right on the other side of the place Vendôme, number 14 houses the Paris office of JP Morgan, the investment bank, and number 20 the office of Ardian (formerly AXA Private Equity). After his death in 1990, American artist Keith Haring was cremated and his ashes were sprinkled out on a hillside near Kutztown, except for one handful, that Yoko Ono brought to the place Vendôme because she believed the spirit of Haring had told her to. In the 1920s, American architect, Alonzo C. Webb worked making advertisements and designs in English for some of the fashionable houses along the place Vendôme. Place Vendôme was a 1998 movie by Nicole Garcia starring Catherine Deneuve. Abel-François Poisson, marquis de Marigny, (1727–1781), the brother of Madame de Pompadour, at 8, Place Vendôme. Claude Dupin, (1686–1769), the financier and contracted tax-collector (fermier-général), at 10, Place Vendôme. Augustin Blondel de Gagny (1695—1776). Samuel Jean de Pozzi, (1846–1918), the surgeon and gynaecologist, at 10, Place Vendôme. Frédéric Chopin, (1810–1849), the Polish composer, at 12, Place Vendôme, where he died. Coco Chanel, (1883–1971), the fashion designer, at 15, Place Vendôme, (the Hôtel Ritz Paris). Franz Mesmer, (1734–1815), the German physician and discoverer of animal magnetism, at 16, Place Vendôme. Virginia Oldoini, Countess di Castiglione (1837–1899), the former mistress of Napoleon III, lived in seclusion from the 1870s until the 1890s at 26, Place Vendôme, above Boucheron. Prince Jefri Bolkiah, at 3-5, Place Vendôme. Located near the Métro stations: Opéra, Pyramides, Madeleine and Tuileries. ^ Chandler, David G. (1995). The Campaigns of Napoleon. New York: Simon & Schuster. p. 320. ^ King, Ross (2006). The Judgement of Paris. New York: Walker and Company. pp. 303–305. ISBN 9780802715166. ^ Milner, John (2000). Art, War and Revolution in France, 1870-1871: Myth, Reportage and Reality. New Haven and London: Yale University Press. pp. 143–145. ISBN 0300084072. Retrieved 1 May 2018. ^ Linda Nochlin. 2007. 'Courbet, The Commune and the Visual Arts.' in Courbet. New York: Thames & Hudson. pp. 84–94. ^ Horne, Alistair (1965). "Chapter 23: 'Floreal 79'". The Fall of Paris: The Siege and the Commune 1870-1. St. Martin's Press, New York. p. 351. ^ Linda Nochlin. 2007. 'The De-Politicization of Gustave Courbet: Transformation and Rehabilitation under the Third Republic.' in Courbet. New York: Thames & Hudson. pp. 116–127. ^ King, Ross (2006). The Judgement of Paris. New York: Walker and Company. pp. 349–350. ISBN 9780802715166. ^ Perrot, Philippe (1996). Fashioning the Bourgeoisie: A History of Clothing in the Nineteenth Century. Princeton: Princeton University Press. p. 41. ISBN 0-691-00081-6. ^ Sarmant, Thierry; Luce Gaume (2003). La Place Vendôme: art, pouvoir et fortune (in French). Paris: Action artistique de la ville de Paris. p. 250. Wikimedia Commons has media related to Place Vendôme (Paris).